Ethel Maud Raeburn (1878-1935). 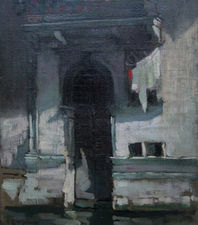 Edinburgh painter in oils and watercolour often of Venetian views; also flower paintings and the occasional portrait. Works housed in Scottish collections. Raeburn exhibited between 1892-1940. Glasgow 1, Glasgow Institute 14, Liverpool 5, London Salon 10, Royal Institute 2, Royal Scottish Academy 35, Royal Scottish Society for Painters in Watercolour 144.